It appears to be becoming a pattern...Monday Musings posts are happening once a month. Ha! Originally I thought I'd do these every Monday...then that changed to twice a month...and now we are at once a month. Sorry guys! I have a great excuse though...or well, multiple great excuses. 1. Things have been wildly busy with so many weddings and engagement sessions, and a few family sessions thrown into the mix!!! 2. I've been spending a lot of my "spare" time working behind the scenes on something B-I-G for my future ELP Brides, and it's going to be uhhhmazing!! Let's just say it involves what will likely end up being a 70+ page online e-book chockfull of tips, tricks and helpful information for planning their wedding, and making the most out of their photography experience! It's basically a super exclusive online community that is being built from the ground up, allllll for future couples who work with me! I can't wait to unveil it!! 3. July is my birthday month. I could really just use this as the entire excuse, let's just be honest. Doing a recap of everything that has been going on seems a little daunting, but I mean....how can I NOT share all the goodness I've been blessed to photograph and such lately!? >> These two....Courtney and Austin... They are the most recent thing you missed hearing about after my last Monday Musings post in June. And these guys are wonderful. For real. I can't wait for their wedding in October! 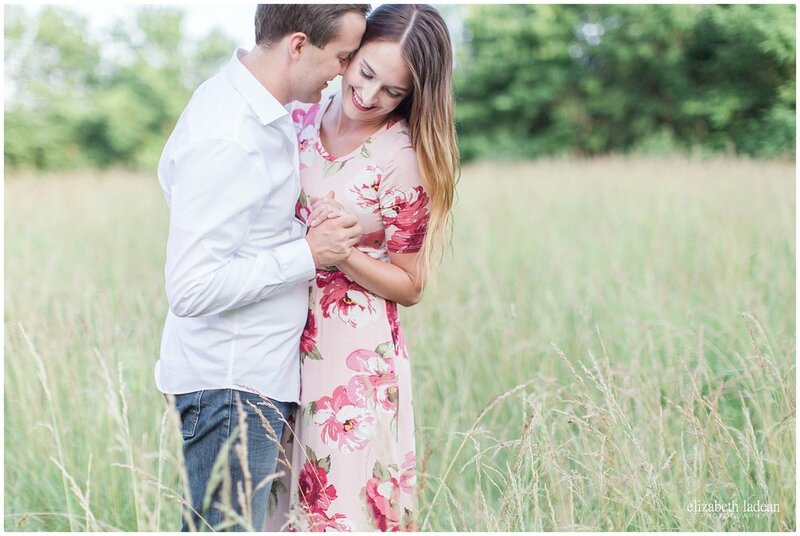 Courtney and Austin's full engagement session! >> June had several weddings, and one of them was easily the hottest day everrrr. It's important I say that because you need to know that regardless of the oppressive heat, it didn't phase Julie and Nate whatsoever! Their wedding day was incredible, and I couldn't possibly love these two souls anymore than I already do!! You can totally go see Julie and Nate's full wedding too! You should honestly, cause despite the fact that it was an outdoor wedding in the muggy heat of June - you'd totally never ever know! Julie and Nate's wedding day! Amanda and Ryan's full proposal story and engagement session! >> The powers of Google led the sweet Ashley to me, and I'm so glad it did! I got together with her cuteeee little family in June for some updated family photos! These guys are great!! >> Who remembers chubby-cheeks baby Sam!? He's so not a baby anymore! Him and his sweet parents spent an evening in June with me for new family photos as well! Sooo good to see these guys again! >> On June 30th, Makayla and Curtis tied the knot and oh my goshhh. Their venue, Abe and Jake's Landing in Lawrence KS sits riiiight by the Kansas River. And I do mean, right by it. When I was scouting for photo locations for their bride/groom portraits, I thought to myself that I might not be able to convince them to get as close to the water as I hoped - it was squishy walking areas and the river was constantly spraying water all over me. BUT GUESS WHAT. They were more than willing to brave the squishy ground and didn't care whatsoever that they constantly got misted by the river, and OH MY GOSH these images rocked my world!! You can see their full wedding at the link below, but definitely check out my most favorite shot of them below the link! Makayla and Curtis' full wedding day! I was/am also a major fan of all the images we did in front of this cool wall! >> July kicked off with Lorraine and Travis' wedding day!! Look at these sweet lovebirds. Justtttt look at them!!! And look at Lorraine...twirling in her amazing gown...my gosh, she's radiant!! >> I got together with the awesome gals from Deer Creek Golf Club in mid June for a little mini styled shoot.. But, instead of being at Deer Creek, we were actually at Blue Springs Country Club! BSCC is about to take the KC wedding industry by storm, with an updated space, and a gorgeous outdoor ceremony spot - I can't wait to document weddings here!! >> Then! Shortly thereafter, I truly was over at Deer Creek Golf Club as they hosted the KC Bridal Group Wedding Show + Open House! This my friends, was a super fun day! I absolutely love being in a situation where I meet new bride after new bride, it's so exciting!! >> On another true-Midwest-muggy-day, Hayley and JJ, and their precious doggy Hank, had their engagement session! We beat the heat like pros! >> I've thankfully had a little bit of downtime in the month of July (did I mention it was my birthday month!?) I'm usually super thankful for the lull in wedding season that happens in the middle of summer! It's not only a break from the heat, but also a time to get projects completed that would otherwise just sit on one of my many todo lists! Liiiiike what I mentioned at the very beginning of this post! It also means things like... Attending my first ever T-Bones game with my old company that I used to work at when I still did a day job! Have I mentioned my husband works there!? He does. Have I mentioned that's where we met at, 8 years ago!? We did!! >> Towards the end of July my awesome as heck in-laws came in for a visit! I'm sure I've said it before, and I'll say it many more times still, but I seriously hit the dang jackpot-of-life with the inlaws I got!!! Julie and Don are simply amazing, and wonderful, and it's hard to even really view them as inlaws because they feel like FRIENDS! Every visit we get with them is full of huge belly laughs, so much good food, lots of board games and more! When they visited toward the end of July, we did all that and also did a tonnnnn of projects in and around our house! My favorites!? - 1. Hanging curtains in my home office!! - 2. Hanging a canvas, a shelf, and a bulletin board over my desk!! See a theme?!? My home office is seriously (finally) coming full circle design wise! A future blogpost will be a-coming to show it off!! >> The actual week of my birthday, I really showed the world just how much of an adult I am. By scheduling my 6-month cleaning/checkup with the dentist. Yuck. Gag. Ughhh. I could write an entire blogpost on just how much I loathe the dentist, and just how extreme my dental phobia is - guys, I'm talking I feel like I can't breathe when I'm in the chair. Yeah. It's THAT bad. But I try really hard to be a responsible adult, haha, and go for routine checks and cleanings. Andddd I survived, yet again. Praise the Lord. >> When the 26th arrived, it was officially my birthday!!! YAYAYAYAYAYAY! I really really love birthdays. I always have!! I have to admit that the older I get, the joy of the birthday is still there, but it's accompanied by a slight panic. I feel like anymore I try to slam my foot into this invisible brake system for life. Like, can we pause a second? Can we just slow down, a tad? Getting older will always be better than the alternative, but admittedly I think I've been on the brink of a mid-life crisis for like, the past year. Ha. I honestly celebrated my birthday basically the entire month, and it was greatttt! It was full of great times with the hubby, with friends, days spent shopping, time spent reading and relaxing. I'm a lucky girl! >> The day after my birthday, I spent the morning at the Humane Society of Greater Kansas City! Wanna know why!? Cause Wes and I both are officially volunteering there! Oh man oh man. Being able to go give love to kitties and help them get accustomed to humans is the best thing ever. I'm soooo glad we are doing this! Now's a good time for a shameless plug - If you don't follow me on Instagram, you are missing out! So much of my time at the humane society was documented on my Insta-stories, so lots and lots of sweet kitties were seen! Follow along over on Instagram! I rounded out the month of July with my first ever visit to the City Market. Wait what!? Kansas Citian's are reading this and thinking I might be crazy....I've lived here for over 9 years and haven't ever been to City Market!??? True story. My best frand knew this was how we needed to celebrate my birthday, and she was right! It was fantastic! - Bundles of flowers for $5 bucks! - Iced vanilla latte in hand! - And white wall portraits! Haha - excellent times my friend, ex-cell-ent times! OH and did I mention she has the most gorgeous engagement ring!!? ?